What is STEAM. Science, Technology, Engineering, Arts & Architecture and Maths. Home Why STEAM ? What is STEAM ? WA4STEAM focusses on women-led startup project in the STEAM fields, but what is in a name? … at first it was SMET…. The U.S National Science Foundation (NSF) used during this 90´s acronym SMET when referring to the career fields in, Sciences, Maths, Engineering and Technology, or to a curriculum that integrated knowledge and skills from those fields. However, in 2001, the American biologist Judith Ramaley, then Assistant Director of Education and Human Resources at NSF, rearranged the words to form the STEM acronym. Since then, STEM-focused curriculum and the acronym have become common in many countries outside of the United States. …and now it is STEAM! 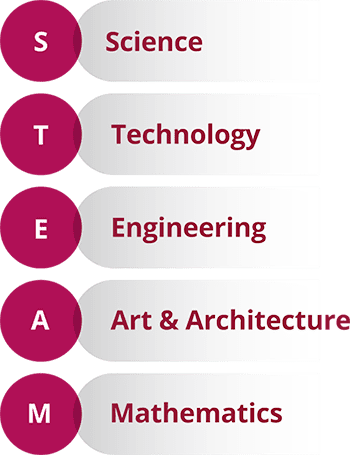 During the “Nineties”, the idea of fostering creativity to promote critical thinking and the use of engineering or technology in imaginative ways to solve real-world problems had started to spread lending the letter A for arts and architecture being added to the STEM acronym. The arts and architectural studies, in all their various forms and related skills are critical components to innovation, and by incorporating them to complement the scientific approach will only strengthen the chances to success. Artistic and design related skills will spark the imagination, produce more creative endeavours and bring about futher innovation.